Did you know that a Jewish Rabbi in Prague discovered if from the beginning of the book of Genesis you skip 50 letters and 50 more, and 50 more letters that the word "Torah" was spelled out. Additionally, it is also spelled out beginning from the books of Exodus, Numbers, and Deuteronomy. Did you know that in the Torah (Old Testament) every 666th letter spells out the phrase "Satan the accuser". This happens exactly 7 times. Did you know in Genesis 1:17, the surface written Word talks about God creating light. Yacov Rambsel, a Messianic Jewish Pastor (reference his book: The Genesis Factor) found that beneath this, that every 94th character spells out the following phrase: "Lighthouse speed conceived". Also, in that same area of text, the Bible Codes reveal: "186,282", which is the exact speed of light per second. ARE THESE BIBLE CODES FOR SURE? 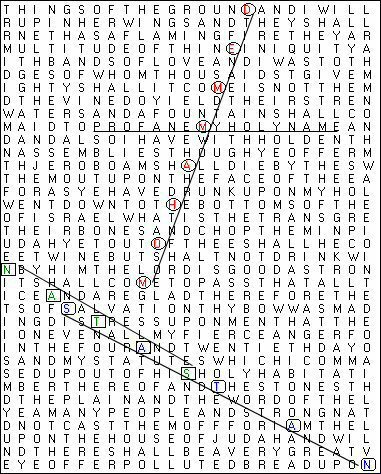 There are way too many occurrances in these Bible Codes suggesting that they are probably not here by chance. They could be the Eternal Father's authentication system - authenticating His supernaturally inspired Word in Scripture; only meant for these "end times" when computers are common. We are all still in the exploration phase of these however......... Nobody is 100% certain about these yet. My personal opinion is that I'm 100% certain there is something going on with these, however. Odds like these are beyond comprehension. Below is an example that one may think relates directly to Lady Diane via ELS in Robert Louis Stevenson's "Treasure Island". Any book may come up with 1 or two things like the book Treasure Island below. But NO Book can come anywhere near the amount the Bible contains. And not only that. What we are seeing in the Bible Codes are exacting with dates, people, and events - so that they cannot be random instances like the Treasure Island book below. If you were to ask me if you should base any theologic or dogmatic decisions on these alone vs Holy Scripture in the Bible --I will always say; "absolutely not". We are not to look to anything esoteric like Bible Codes for dogma. One thing I have noted about the Bible Codes is that, just like ALL Scripture--they too point toward, and scream out; "Jesus Christ (Yeshua) is the Son of God, He is your Savior, Your Messiah, Lord of Lord and King of Kings". Listen to the Holy Spirit in all matters of faith and dogma. The fact that the words; "Jesus is My Name" was not too long ago found by Yacov Rambsel in the most germane "Suffering Servant" passage (Isaiah 52-53) lends more credibility to these codes. God's saving grace is an unbroken pattern both in the Biblical text and perhaps also now via the Bible Codes. The idea of a hidden code in the Bible text is not new. It is a central concept in the Cabala, or traditional Jewish mysticism. According to Cabalistic teachers, the simple meaning of the Bible text is not its true meaning. They believe that God used the individual letters of the Hebrew Bible text as symbols, which when properly understood reveal a greater truth. In their view, each Hebrew letter and its position in the Bible text was set by God with a specific purpose in mind. 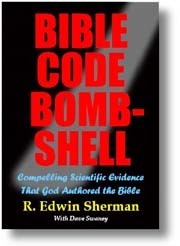 Bible Codes and written surface words are just two facets of the Bible. According to ancient Jewish tradition, the Bible has 70 facets. Many say that everything is in the Torah--encrypted in some way. Your birth date, your death date, when you will marry, etc. 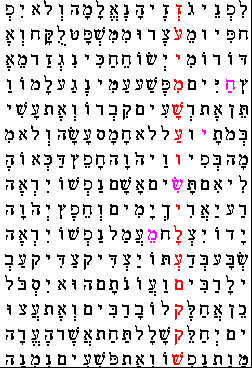 It is believed that the Bible code, found in the Bible's original Hebrew form, was initially discovered by the rabbi H.M.D. Weissmandel in Prague, Czechoslovakia, some 50 years ago. By skipping the first 50 words and then another 50 words, the word 'Torah' - the Pentateuch, the first five books of the Old Testament usually ascribed to Moses - was spelt out at the beginning of the Book of Genesis. The same skip sequence spelled out 'Torah' in the Book of Exodus, the Book of Numbers and in the Book of Deuteronomy. A passage written about the Torah by an 18th Century rabbi and "sage", Elijah Ben Solomon Zalman (1720-1797), called the Genius of Vilna says: "The rule is that all that was, is, and will be unto the end of time is included in the Torah, from the first word to the last word. And not merely in a general sense, but as to the details of every species and each one individually, and details of details of everything that happened to him from the day of his birth until his end." In tractate Sanhedrin we read: "Daniel decoded the message, placing the second word under the first, and the third under the second, and then reading down...."
This view of the Scriptures is different than our modern idea of the Bible. So long as the contextual meaning of the verses remain in tact we are not too concerned with "the smallest letter." However, the statement of Jesus above shows an awareness that each individual letter is essential to the whole message. That is exactly true of the Bible Code. Since it involves exact mathematical precision every letter must be in its place or the code will not work! Surely, the above statement shows that the Son of God had a supernatural awareness of the amazing depth of meaning in every letter of God's Word! DO WE NEED THESE BIBLE CODES? Probably NOT! But Why Not? Certainly we have enough in both the New Testament and Old Testaments for absolute salvation and eternal life. But what about the "hunt"? Could God be such a loving Father that He just knew we would enjoy hunting for more of His word? Wouldn't the following verse seem to suggest this? The apostle Paul very clearly wrote that "all Scripture is inspired of God and beneficial for teaching, for reproving, for setting things straight, for disciplining in righteousness, that the man of God may be fully competent, completely equipped for every good work." (2 Timothy 3:16, 17). The prophecies that are openly presented in the Bible give a solid basis for believing its inspiration. Unlike a hidden code, Bible prophecies are not arbitrary, and they do not 'spring from any private interpretation. (2 Peter 1:19-21). How happy we should be to have the Bible's clear message and instruction, which can help us to know God! Yet maybe Bible Codes will someday clarify things in Scripture. Was Jesus talking about the entire generation who saw Israel become a nation in 1948 when He said; "This generation shall not pass" (before the Lord Jesus comes again)? Or, was He talking about the generation born in 1948 and after (Baby Boomers)? It is also interesting that the "Computer Age" which was necessary to search these codes began subsequent to this. So, just perhaps there is something here in the codes for us. Perhaps not. See more on the Second Coming here. Matthew 32-34: Now learn a parable of the fig tree; When his branch is yet tender, and putteth forth leaves, ye know that summer is nigh: So likewise ye, when ye shall see all these things, know that it is near, even at the doors. Verily I say unto you, This generation shall not pass, till all these things be fulfilled. Matthew 16:27 For the Son of man shall come in the glory of his Father with his angels; and they shall reward every man according to his works. Revelation 1:7: Behold, he cometh with clouds; and every eye shall see him, and they also which pierced him: and all kindreds of the earth shall wail because of him. Even so, Amen. 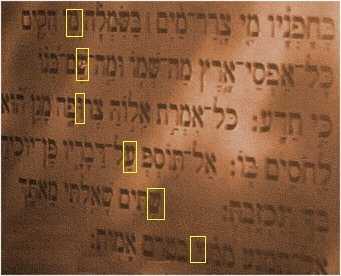 There is an old Jewish tradition about a "hidden text" in the Hebrew Pentateuch (the Five Books of Moses), consisting of words or phrases expressed in the form of equidistant letter sequences (ELS's) -- that is by selecting sequences of equally spaced letters in the text. Since this tradition was passed orally, only few expressions that belong to the "hidden text" were preserved in writing (Rabbenu Bahya, 1492 and Cordovero, 1592); actually almost all the words and the syntax are unknown. Rabbi H.M.D. Weissmandel (Weissmandel, 1958) was the first to try to show the existence of such a "hidden text", by finding interesting patterns consisting of ELS's. Introduction - God's Authentication System? 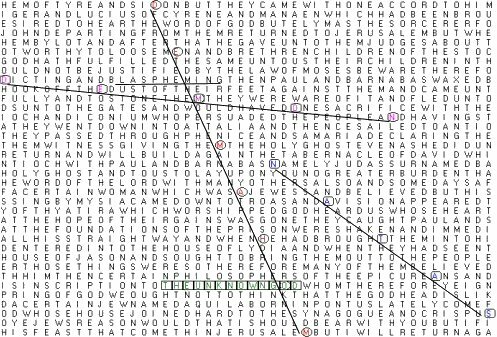 What's the purpose of the Bible Codes? Most Important Code FOUND - Praise Jesus! ---Yacov Rambsel found: Every 12th Letter in Hebrew spells "JESUS IS MY NAME"
"NAZARENE" is also in the same chapter, along with seventy- four of the names, places, and events of the time period of Jesus of Nazareth! What is His son's name? 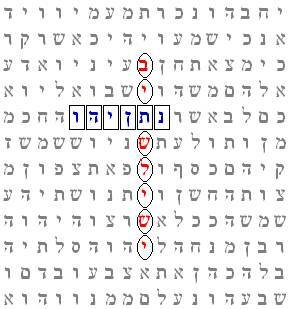 Starting with the first yod, counting every 22nd letter spells – you guessed it – Yeshua shai, which means "Yeshua, the Gift." Yeshua means Jesus in Hebrew. What's left to say? This skip "45" is the minimum skip distance to the whole Tanakh. Psalm 22 is the most important prophecy of the Messiah's Passion as well as Isaiah 53. It is a pin-point overlap that the minimum skip appears in that prophecy. The skip "45" is equal to the gematria of "Adam" in Hebrew. This shows that Jesus came as the Second Adam. The First Adam brought sin and death, while the Second Adam brought righteousness and eternal life. from earlier book: "His Name is Jesus"
To the novice - it is important to note that the proximity to passages -- and how germane this is -- is beginning to startle even non-believing scholars. It's very significant that the below were found in a very relevant area of Isaiah known as the "Suffering Servant" passages. "If the Friend of Evil will Thirst for the End of My Innocence, His Home is an Urn. Let Judas Have His Day. To Me, the Exalted One, They Fasted. Where are You? Its Content will be Written from My Mouth. Father, Indeed You will Raise the Dead Over There." "The message in the code seems to be very appropriate to the character Judah as he is presented in the Gospels," said mathematician Ed Sherman, President of the Society. "Coherent codes that are 30 or more letters long are highly unlikely to be the product of chance." The new code appears in the "Suffering Servant" area of Isaiah 53 "cluster", a huge collection about the final days of Jesus Christ which includes the names of all the apostles and the three Marys present at the Lord's crucifixion. The new code skips every 738th letter, beginning in Isaiah 29 and ending in Jeremiah 3. It was discovered by Dr. Nathan Jacobi of the society, a physicist and Hebrew expert while doing a search of disciples' names in the Isaiah 53 cluster. What is striking about most of the great codes found to date is how these cluster near a surface textual passage relating to the code. "Gushing from above, my mighty name arose upon Jesus, and the clouds rejoiced,"
"In his name as he commanded, Jesus is the way,"
"Resurrection of Jesus, he is risen indeed,"
Words crossing diagonal above: "Blaspheming"
Red crossing Diagonal below Blaspheming (left to right): "Demon"
Blue diagonal right corner: "Satan"
The "O" in "Mohammed" is the "O" in "God" in "The Unknown God". This is saying that Allah of Islam is not the God of the Bible, who is the true God, but rather Muslims are worshipping a nonexistent deity. AND below: "MOHAMMED" crosses "PROFANE MY HOLY NAME"
In Purple above spells; "Mein Kampf" / Green spells; "Hitler"
Dome of the Rock is the "Abomination of Desolation"
You won't put this book down! Proof the true God of the Bible and prophecy (Yahweh/Jehovah/I am/Jesus) considers Islam as an evil pagan religion. He is disgusted with those monstrosity's on the Temple Mount. The "abomination of desolation" already happened exactly on schedule (Daniel's 1290 day prophecy). When the pagan Islamic Dome of the Rock and the al-Aksa Mosque were built on the temple mount, it made the temple mount "desolated" or contaminated. This was built during the 685 to 705 AD period. The formula for changing 1290 old testament 360 day years into our 365.24 day solar years is: 1290 x .9857. Amazingly enough the 2nd figure (1335) the prophet Daniel gave serves much like a double check (CheckSum). Subtract this figure from 1948 when Israel was reborn after 2500 years and you get another significant year for the Jews, Christians and all of western civilization. This figure plops exactly onto the year Muhammad of Islam, the False Prophet died and was lowered into a grave in Medina in the year 632 A.D.
Read this free ebook by Ellis Skolfield about the above. It's called, "The False Prophet". Read "Muhammad, Terrorist or Prophet?" Historical Truth about Mohammed Freemasonry Exposed Are Jehovah Witnesses Christian? Jesus found in Bible Codes Bible Codes OT Prophecies about Jesus Psalms Map History Evidence of Miracles Discussion Board Do Jehovah Witnesses deny Jesus? Near Death Experiences UFO's maybe Demonic Signs of the Times Israel the Greatest Sign Torah layout Prophetic Church and State Abortion is Wrong Homosexual Abomination Ark of the Covenant Catacombs of Rome Where is Noah's Ark? Archko Volume Red Sea was Parted Daniel Prophecy of Jesus The Rapture The Nephilim Shroud of Turin Jesus before Bethlehem Archeology and the Bible What happened to Apostles? Church History from Jesus Creationism vs Evolutionism Holy Land Briefs The Holy Lance Genesis in Chinese Language Archeology and the Bible Book of Revelation Commentaries on Isaiah Lost Tribes of Israel Fig Tree is Israel Temple Mount Furor Exorcism Jesus' Descent to Hades Creationism vs Evolutionism Messianic Jews for Jesus The New Age Threat Demonic Course in Miracles Book of Revelation Old Testament Curses Favorite Charities 2 Days equals 2000 yrs Hebrew Acrostic America's Morale Decay Theomatics, Gematria, Christmatics Christian Music Good News Videos A Tour of Hell? Vision of Saint Paul Nave's Topical Bible Free Russian Bible Free Polish Bible Free Chinese Bible Free Arabic Bible Christian Book Reviews Coincidence or Blueprint?